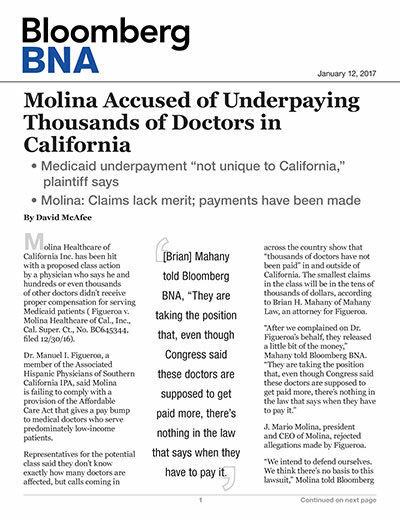 Molina Healthcare of California Inc. has been hit with a proposed class action by a physician who says he and hundreds or even thousands of other doctors didn’t receive proper compensation for serving Medicaid patients (Figueroa v. Molina Healthcare of Cal., Inc., Cal. Super. Ct., No. BC645344, filed 12/30/16). Dr. Manuel I. Figueroa, a member of the Associated Hispanic Physicians of Southern California IPA, said Molina is failing to comply with a provision of the Affordable Care Act that gives a pay bump to medical doctors who serve predominately low-income patients. Representatives for the potential class said they don’t know exactly how many doctors are affected, but calls coming in across the country show that “thousands of doctors have not been paid” in and outside of California. The smallest claims in the class will be in the tens of thousands of dollars, according to Brian H. Mahany of Mahany Law, an attorney for Figueroa. Mahany says Molina has promised to fulfil its legal obligations but hasn’t given a timeframe for the disbursements. He expressed skepticism about that position. He added that, while Molina may call these “delayed payments,” an extended period of time is the only difference between a delay and a default. Molina rejected Mahany’s characterization of the dispute. He said the payments have been made under the now-defunct ACA Rule 1202, which provided supplemental payments to primary care doctors for certain services. “The company incorrectly takes the position that Congress gave no deadlines as to when the money must be paid,” Mahany told Bloomberg BNA. Molina added that part of the confusion may arise from the fact that the company contracts with individual doctors, as well as medical groups and independent practice associations (IPAs). Molina has only been hit with one complaint so far—in California—but Mahany and his team are exploring additional actions in Texas, Ohio, South Carolina, Florida, Illinois, Washington, Mississippi, New Mexico and Puerto Rico. The ACA is a federal statute, so it is likely Molina engages in the same behavior elsewhere, Mahany noted. “I do think this isn’t unique to California,” he said. Molina said claims in other states would be similarly meritless. Molina sells insurance in fifteen states, according to its website. Figueroa is represented by Mahany in Wauwatosa, Wisc., Barnes Law Attorneys Robert E. Barnes and Douglas M. Hanchar in Los Angeles and Douglas P. Dehler and Laura J. Lavey of O’Neil, Cannon, Hollman, Dejong & Laing SC in Milwaukee, Wisc. Counsel information for Molina wasn’t immediately available.